“Copywriting as a job. What’s it like?” asked the high school girl as she interviewed me for a class project on careers. This young lady excelled in her English classes … was an avid reader … loved to write … but she was afraid she would not be able to make a living as a writer or editor. Why couldn’t that somebody be her – or you? Companies, organizations, small businesses – everyone needs the written word. Most business leaders are too busy to write, don’t like to write, or don’t write well. That’s why they hire staff writers or freelance copywriters. You can write about health care, politics, travel destinations, finance – or the spotted purple frog. All kinds of organizations need good writing. Most copywriters eventually find a niche, developing skills and a portfolio in a particular area. One copywriter friend writes exclusively for law firms, attorneys, and about legal issues. Another labels himself “The Dental Copywriter.” Seriously. Even the most mundane copywriting projects are fun – if you like to write. Plus, the marketplace continues to grow and change, providing the opportunity for copywriters to develop skills needed for new kinds of writing projects. A decade ago social media was in its infancy. Today, businesses devote entire staff positions to social media copywriting. Businesses hire staff writers for their creative departments, making copywriting a full time job with benefits for many. But equally lucrative (sometimes more so) is freelance work. Freelancers have the freedom of working from home or an office on their own schedule for the clients they choose. A distinct advantage of becoming a copywriter is that it’s a reachable goal for anyone who works hard enough. You don’t need to have a college degree to find well-paid work as a copywriter. Take courses, get critiqued, study all kinds of copy, and start building a portfolio. Copywriters need to continue to produce good copy for their employer or client even if the writing muse doesn’t strike. Churning out copy day in, day out can get tiring. Smart writers know they can’t write for hours each day without filling their “creative tank.” To do so means burnout. Most writers work alone to produce copy, even when they’re part of a creative team. For some people, this is not a disadvantage, but rather they naturally most productive in solitude. Regardless of personality type, copywriters soon learn ways to balance solitude and interaction with others. 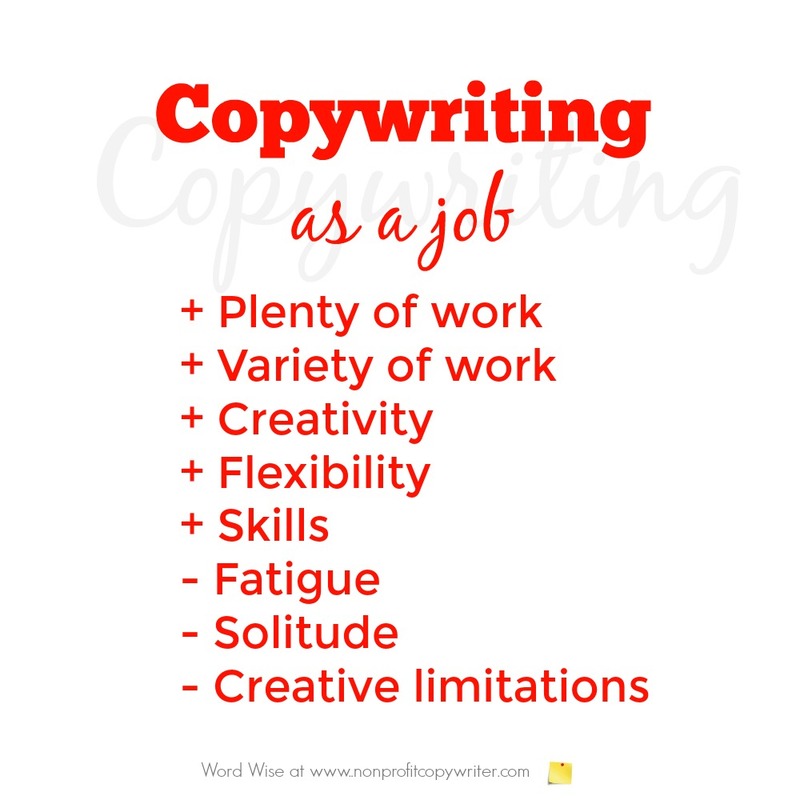 Copywriting is one of the best-kept secrets in the job market. Copywriters are needed everywhere and there are not enough good ones to go around. As long as people use words to communicate, there will be an abiding need for writers who can use words to get a message out persuasively.